Recipe adapted from here. Instead of cranberry i have used walnuts to give crunchy taste. Sieve maida, baking powder and salt. Combine them in a bowl and mix well. Keep aside. Beat eggs till smooth. 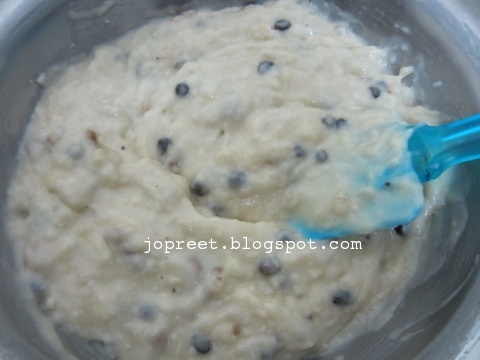 Mix beaten curd and sugar. Beat it for few mins. Add to the beaten egg and beat everything lightly. Add this to the mashed banana and beat it again. Make sure no big lumps are formed. Add vanilla essence and olive oil. Beat it again. Add this mixture to the dry ingredients. Mix well. Add walnuts and choco chips in between while mixing. Preheat oven to 180 degrees C for 10 mins. Spray the muffin liners with little oil and keep it in the cups of muffin pan. Take two tablespoon of the muffin batter and drop it in each muffin cups. Keep the pan in middle rack and bake at 180 degrees C for 15-18 mins. Insert a toothpick at the center of the muffin. It should come out clean. Take out the pan from oven and let it cool little bit in the pan for 10 mins. Transfer the muffins on the cooling rack and let it cool completely. Serve it immediately or keep it refrigerated. Moist,soft and delicious .lovely banana muffins!! Delicious and creative presentation. Love it. Banana muffins are my favourites! Walnut with choco chips….love this combo with banana. Can guess its taste dear..yummy! muffins look so cute along with your plank. 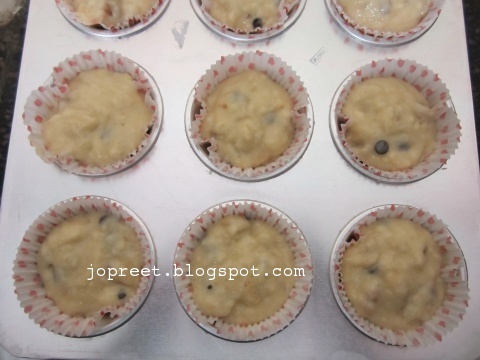 Wow…..wonderful muffins…..looks so soft & yummy. 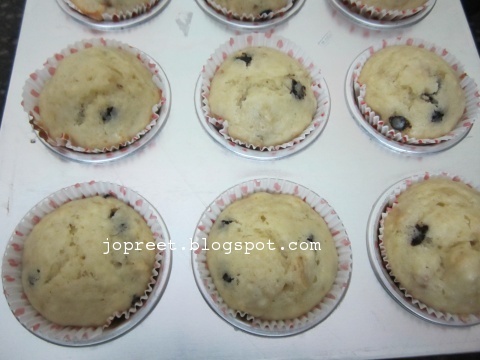 Super spongy muffins, love to grab those beauties and have atleast one rite now. one of our fmaily fav muffins, looks so soft n delicious! looks like you're truly enjoying & baking in your new oven,Great & soft muffins!! Banana and walnut is a classic combo.. The muffins looks so soft and delicious!